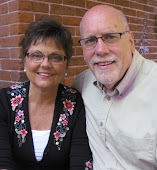 Our visas have been approved for another year! L'Hamdilla! We often take for granted that it is a privilege to serve in any foreign country, especially when working with the church. In the case of Israel, thousands of American tourists pass quickly through Ben Gurion airport with automatic visitor's visas stamped quickly on blank passport pages. We are not here as tourists and thus we are subject to a longer process with the expectation of following certain rules and regulations (e.g. no proselytizing) and of discretion in what we say and do. So the renewal of our visa for another year is never something we take for granted. And now we say L'Hamdilla! Praise God. This last week you could hear a shout of L'Hamdilla, from every church in Jerusalem when Bishop Suheil Dawani of the Anglican Church received his residency permit for Jerusalem after a lapse of two years. The Church, of course, extends beyond borders and bishops must be free to travel on a regular basis to their parishes whether they be in Israel, the West Bank, Gaza, or Jordan. The bishop's residency in Jerusalem is not only a matter of practicality, it's part of the historic character of the church--for Anglicans Jerusalem has been the bishop's residence since 1841, when the joint Lutheran-Anglican bishopric was established. 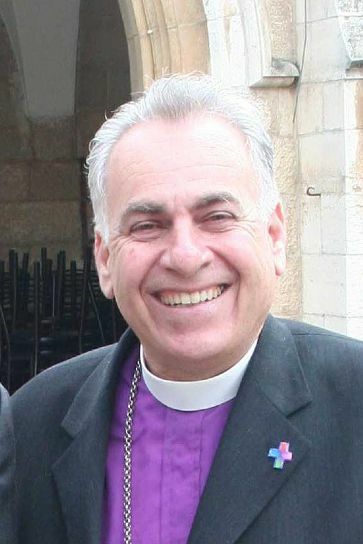 Bishop Dawani faced this situation because he is a Palestinian and was born in the West Bank city of Nablus, twenty-five miles north of Jerusalem. Although he was elected already in 2005, and was previously given residency permits for Jerusalem, for the last two years his permits were rejected. This put him in the difficult situation of having to live illegally in East Jerusalem at St. George's Cathedral and it put the Anglican Church in the position of having to sue the government after working quietly behind the scenes for eighteen months. So on Monday it was announced that he had succeeded and a new permit has been granted. L'Hamdilla. For the Sept. 27 Haaretz newspaper article click here. Such cases are not totally isolated. Last Tuesday, we visited with a young German volunteer who had come to serve at the Dormitian Catholic Church just outside Zion Gate. He had just received a visa rejection letter stating uncertainty about the religious character of his declared place of service. So he is now planning to appeal. Inshallah. A decade ago a newly elected Greek Orthodox Patriarch was denied official government recognition for several years. The Roman Catholic Church has often had difficulties for its seminarians coming here to study. Our own YAGMs had to postpone their arrival for several weeks, with all the hassle of changing travel plans, because of visa delays. 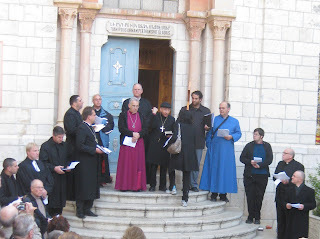 In the photo on the right Lutheran and Anglican clergy pause for prayers at Station # 4 on our 2011 Good Friday walk of the Via Dolorosa. Bishops Dawani and Younan stand together at the top of the stairs. Looking at this photo from just six months ago, we are reminded how tenuous our positions can be. Three of our Anglican colleagues in the photo are no longer with us in Jerusalem. 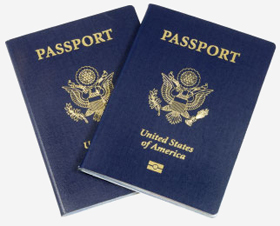 One who is American had just returned from an unplanned three-month leave to the states because of visa issues. Ultimately the visa was renewed, but only for six months, so now he is gone. We don't take things like this for granted. This is simply the way it is in the world. So whenever a visa or a residency permit is granted, we say L'Hamdilla. Perhaps this is the way it's always been. Paul wrote to the Church in Rome: "Do you wish to have no fear of the authority? Then do what is good." (Romans 13:3). 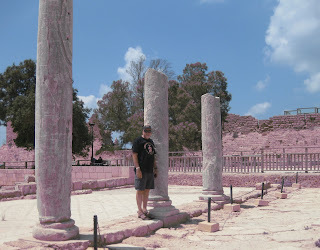 The ancient city of Caesarea on the Mediterranean Coast is where Pontius Pilate had his residence. This is the city where Paul sat in prison two years waiting to face Nero in Rome. 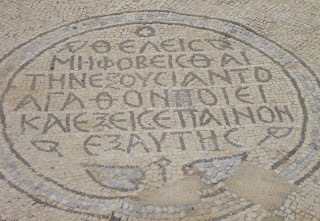 Caesarea is where Fred got his start in archaeology in the summer of 1974, excavating this Byzantine colonaded street, just south of the Crusader fortress. A public building had just been uncovered next to these columns. 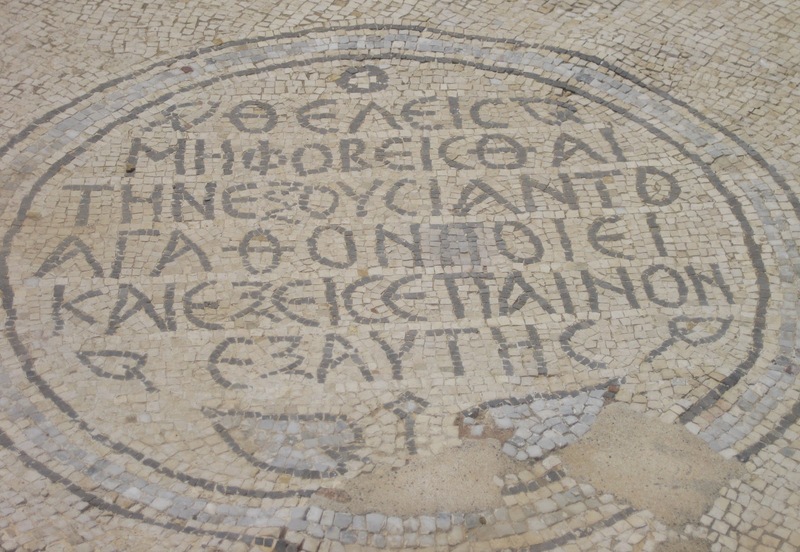 Though it was a government building, several rooms had religious inscriptions in Greek, and, though several centuries had passed since Paul's sojourn here, his words were there for all to see. "Do you wish to have no fear of the authority? Then do what is good and you will receive approval."